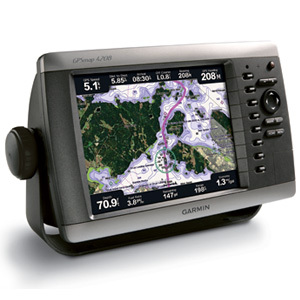 This preloaded, offshore chartplotter combines the power of networking with brilliant color and slim-line design. 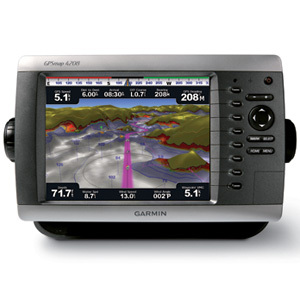 The GPSMAP 4208 has preloaded BlueChart® g2 maps of the U.S. coast and displays them on an 8.4” (21.34 cm) VGA display with video-quality resolution. By connecting to the Garmin Marine Network, you can add sonar, radar and weather. For even more enhanced features, you can add the optional Bluechart® g2 Vision® card (sold separately). The 4208 features highly-detailed BlueChart g2 marine cartography of the coastal U.S., including Alaska, Hawaii and the Bahamas. This data provides detailed coastlines, shaded depth contours, navaids, port plans, wrecks, restricted areas and tide and current information. For other areas, the 4208 has a worldwide basemap with high-quality satellite images in place of more traditional maps. With the SD™ card slot, you can add additional maps without having to connect to a computer. The 4208’s high-speed processor draws maps quickly, and its simple intuitive interface makes navigating easy. To keep tabs on your engine room or other area of your boat, you also can connect a live video feed with the 4208’s video input and output options. 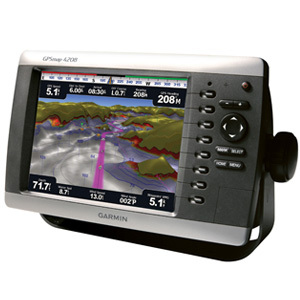 The 4208 connects easily to the high-speed Garmin Marine Network, so you can interface with additional MFDs and add remote sensors. Once connected, you can share information between the 4208 and other chartplotters on your boat. You also can add high-powered radar, sonar and XM satellite weather and radio to your system.